For the town in New Zealand's South Island, see Palmerston, New Zealand. Palmerston North (Māori: Te Papaioea or transliterated Māori: Pamutana), commonly referred to by locals as Palmerston, or colloquially Palmy, is the main city of the Manawatu-Wanganui region of the North Island of New Zealand. The city is inland, located in the eastern Manawatu Plains, centred near the north bank of the Manawatu River. The city is 35 km (22 mi) from the river's mouth and 12 km (7 mi) from the end of the Manawatu Gorge. It is also about 140 km (87 mi) north of the capital, Wellington. The city covers an area of 325.94 square kilometres (126 sq mi). The official limits of the city take in rural areas to the south, north-east, north-west and west of the main urban area, extending to the Tararua Ranges; including the town of Ashhurst at the mouth of the Manawatu Gorge, the village of Bunnythorpe in the north and the village of Longburn in the south-west. Included in the city limits are rich and fertile agricultural areas. The city's population is expected to exceed 85,000 (2012), it is the country's seventh largest city and eighth largest urban area. The city is the fourth fastest growing in New Zealand, and is set to break the 100,000 population mark in the near future, qualifying to be a metropolitan area. One million people live within a two-hour drive (200 km/120 mile radius). The city's location was once little more than a clearing in a forest and occupied by small communities of indigenous Māori, who called it Papaioea, believed to mean "How beautiful it is". In the mid 19th century, it was discovered and settled by Europeans (mostly of British and Scandinavian origin). The settlement was bestowed the name Palmerston, in honour of Viscount Palmerston, a former Prime Minister of Great Britain. The suffix "North" was added in 1871 by the Post Office to distinguish the settlement from Palmerston in the South Island. 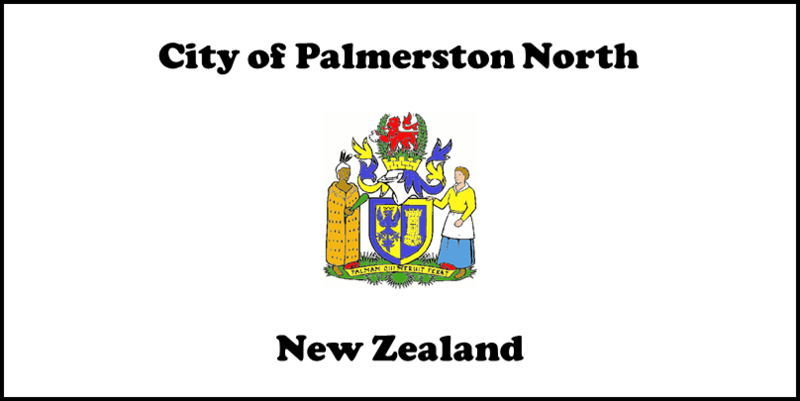 The Māori transliteration of Palmerston North, is Pamutana (Nota). However, Te Papaioea is the preferred Māori name. Looking SE towards Palmerston North city centre from Palmerston North Hospital. In the distance is Tararua Range. Palmerston North has a land area of 325.94 square kilometres (80,500 acres). Of this, the area in public reserves is 5.54 square kilometres (1,369 acres). 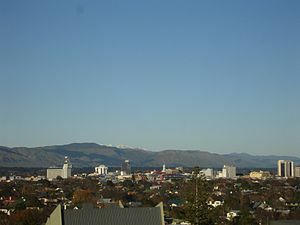 Although bordered by the Ruahine and Tararua range in the east and south respectively, the city is predominantly flat. The occasional rise in elevation occurs in the northeast and on the south side of the river. The typical urban area elevation ranges from 20–40 metres (65–130 ft). The highest point is 760 metres (2,493 ft) above sea level. This is in the Tararua ranges, south-east of Scotts Road. The lowest Point is 10 metres (33 ft) above sea level. This is at the river bank near Te Puna Road. The length of the Manawatu river within the city boundary is 29.9 kilometres (18.6 mi), and that of its tributary at Ashhurst, the Pohangina, is 2.6 kilometres (1.6 mi). Palmerston North's climate is temperate with maximum daytime temperatures averaging 22 °C (72 °F) in summer and 12 °C (54 °F) in winter. On average temperatures rise above 25 °C (77 °F) on 20 days of the year. Annual rainfall is approximately 960 mm (37.8 in) with rain occurring approximately 5% of the time. There are on average 200 rain-free days each year. In the ranges that flank the city there is often sustained wind, especially in spring. Much of this land is within the city boundaries and these ranges have the reputation of providing the most consistent wind in the country. Close to the city is the largest electricity-generating wind farm in the southern hemisphere, with 158 turbines in the Tararua and Ruahine Ranges providing power for approximately 30,000 homes. At the 2006 census, Palmerston North had a population of 75,543, an increase of 3507 people (4.9%) since the 2001 census. There were 27,849 occupied dwellings, 1,662 unoccupied dwellings, and 189 dwellings under construction. Palmerston North's ethnicity was made up of (national figure in brackets): 71.4% European (67.6%), 15.4% Māori (14.7%), 7.4% Asian (9.2%), 3.7% Pacific Islanders (6.9%), 1.1% Middle Eastern/Latin American/African (0.9%), 12.5% 'New Zealanders' (11.1%), and 0.05% Other (0.04%). Of the population, 36,345 (48.1%) were male and 39,192 (51.9%) female. The city had a median age of 32.4 years, 2.5 years below the national median age of 35.9 years. People aged 65 years and over made up 11.6% of the population, compared to 12.3% nationally, and people under 15 years made up 20.3% of the population, compared to 21.5% nationally. Due to Palmerston North being a university city, approximately 36% of the population is aged between 15.0 and 24.9 years. The average annual income of all people 15 years and over was $23,100, compared with $24,400 nationally. Of those, 44.9% earned under $20,000, compared with 43.2% nationally, while 15.4% earned over $50,000, compared to 18.0% nationally. Palmerston North City had an unemployment rate of 5.3% of people 15 years and over, compared to 5.1% nationally. The largest industry in terms of employees is the health and community services industry, which employs 14.9% of employees in the city. The retail trade industry employs 13.3% of employees in the city. This reflects the city's role as an important retail service centre in the Lower North Island. The tertiary education sector provides NZ$500 million a year to the local economy  and the education sector accounted for 11.3% of the Palmerston North workforce in February 2006. Palmerston North has economic strengths in research, especially in the bio-industry, defence, distribution and smart business sectors. The city is home to more than 70 major educational and research institutions, including New Zealand's fastest expanding university, Massey University; the Massey University Sport and Recreation Institute at the Massey University campus, Turitea; Universal College of Learning (UCOL) and Linton Army Camp. Palmerston North has a long history of innovation in the business sector. A number of firms founded in or near the city have become nationally or internationally renown, one of the largest and well known, GSK (GlaxoSmithKline). Glaxo had its beginnings in Bunnythorpe, now a part of Palmerston North. Palmerston North is an important base for tertiary institutions, the home campuses of Massey University, Universal College of Learning (UCOL) and International Pacific College are here. A large proportion of Palmerston North's population consists of students attending these institutions or the various Papaioea Campuses of Te Wananga o Aotearoa during the student year. The main hospital in Palmerston North is Palmerston North Hospital. It is the seat of the MidCentral District Health Board. There are two private hospitals, Aorangi and Southern Cross. The Palmerston North Police are responsible for law enforcement in the city area. The main Police Station is in the central business district, a short distance down the road from The Plaza. Community Police centres exist in Ashhurst, Highbury, Linton, Massey University and Rossmont (Roslyn). In the years between 2006 and 2010 the crime rate in Palmerston North was similar to that of New Zealand as a whole. Overall, the number of offences, as recorded by the Palmerston North Police stations has declined (2012). Violent crime has increased by 5% in the past year but this is compared with an 11% rise nationally. Satisfaction with safety in public places at night has remained at its 2007 level. New Zealand Police Central District is shown in orange. The Central District covers the Ruapehu District in the north, to Otaki in the south and includes Taranaki, Wanganui, Manawatu, Horowhenua and Tararua. The Central District's Headquarters are in Palmerston North. Palmerston North Courthouse seats a High/District Court and is located at Main Street (east). Palmerston North has a number of religious institutions and a high percentage of worship against the national average. The high number of Christian fellowship in Palmerston North has been reflected in the adornment of the Christian cross on the city's clock tower. Palmerston North is a cathedral city. The Cathedral of the Holy Spirit (also known as St Patrick's Cathedral) is the seat of the Roman Catholic Diocese of Palmerston North. Palmerston North is in the jurisdiction of the Anglican Diocese of Wellington. There are also many other churches with denominations such as Adventist (Mosaic Community Church and Palmerston North Seventh Day Adventist Church), Apostolic, Assembly of God (AOG), Baptist, Brethren, Christian Scientist, Church of Christ, Church of Jesus Christ of Latter Day Saints, Jehovah's Witnesses, Lutheran, Methodist, Pentecostal, Presbyterian and Religious Society of Friends. There is a Sikh temple in Awapuni. There is an Islamic centre in West End and an Islamic prayer centre at Massey University. The city has used many descriptions in advertising and promotion, including "Rose City" (referring to its international rose trial grounds) and "Knowledge City" or "Student City" (referring to the city's many academic institutions). The current slogan, "Young Heart, Easy Living", indicates that Palmerston North is a city of young people and people with a youthful attitude. Palmerston North has a number of facilities and attractions. It is also the gateway to attractions in other parts of the region, such as Tongariro National Park, Ruahine and Tararua Ranges. When Palmerston North International Airport serviced international flights, the city was also an international gateway to Hawke's Bay, Wanganui and Taranaki. The Plaza is the largest shopping centre in the Manawatu-Wanganui region and a key shopping centre in the lower North Island, boasting over 100 stores. It was built in about the 1970s to the 1980s and then upgraded again in around the late 2000s to what it is now. In the opening week of the upgraded plaza people came from all over the North Island to have a look around. Downtown on Broadway combines retail and boutique shopping with a foodcourt and Downtown Cinema. Originally part of the Papaioea clearing, The Square is a seven-hectare park of lawn, trees, lakes, fountains, and gardens in the centre of the city. It is the city's original park and also the centrepoint from whence the city's main streets are arranged. The Square contains the city's war memorial and a memorial dedicated to Te Peeti Te Awe Awe, the Rangitāne chief instrumental in the sale of Palmerston North district to the government in 1865. Near the centre of the park is the Clock Tower with its illuminated cross and coloured lights. Also here is the city's iSite, the Civic Building (seat of the City Council), the City Library, Square Edge and the commercial heart of Palmerston North's CBD. Retail stores (including the Plaza) and eateries line the road surrounding the park. In around 1878, a Māori contingent, including Te Awe Awe, gathered together to choose a Māori name for The Square. They chose Te Marae o Hine, meaning "The Courtyard of the Daughter of Peace". This name reflected their hope all people of all races would live together in enduring peace. Victoria Esplanade Gardens are located along the northern bank of the Manawatu River, west of Fitzherbert Avenue. The esplanade gardens include serene native bush surrounding family-friendly facilities, an aviary, a café, a duck pond, a miniature railway and walking tracks within the bush. The Gardens were opened to commemorate the 60th Jubilee of Queen Victoria's reign (1897). Nearby the Esplanade are the multi sport playing fields of Ongley and Manawaroa Parks, the twin turf hockey fields and Fitzherbert Park, the premier cricket ground. Elsewhere in the city are parks for sports like rugby, such as Coronation Park, Bill Brown Park and Colquhoun Park (also used for softball/baseball); and football: Skoglund Park (home of the Central Football Federation) and Celaeno Park. Memorial Park has a football pitch, and also has family-friendly facilities. The Lido Aquatic Centre is Palmerston North's largest. It provides outdoor facilities including a family leisure pool, a 50 m pool for competitive swimming and a dive pool. Indoor facilities include another family lesiure pool, spa pool, heated pool and a cafe. Freyberg Community Pool is an all-year indoor swimming pool complex located next to Freyberg High School in Roslyn. Te Manawa is the cultural museum of art, science and history. Attached to Te Manawa is the New Zealand Rugby Museum. Palmerston North has 5 libraries and one mobile library. Palmerston North Library is located in the Square and houses the main collections. The other four are located in Ashhurst, Awapuni, Roslyn and Te Pātikitiki (Highbury). Nearby the Square is the Youth Space, opened in September 2011 as a dedicated place for Palmerston North's many young people to congregate in a safe environment. The Tararua and Ruahine ranges are noted for being windy, and an ideal location for harnessing the power of the wind. The Tararua and Te Apiti Windfarms realise this. The Tararua windfarm consists of 134 windmills with blade lengths of 23.5 and 45 metres. Part of this windfarm is in the area of Palmerston North City Council boundary. Te Apiti windfarm on the brow of a hill in the Ruahine range chain next the Manawatu River, has 55 windmills with blade lengths of 35 metres. Trust Power owns the Tararua while Meridian Energy owns Te Apiti. Although Te Apiti is under the jurisdiction of Manawatu District, the proximity to Ashhurst make them an attraction for Palmerston North. The arts and culture of Palmerston North is both broad and deep. Nationally and internationally famous performers, artists, comics, authors and musicians come from or live in the city. Creative Giants is a website that was launched in 2011 to celebrate the creative talent of Palmerston North. It is updated regularly. The main art gallery is at Te Manawa. There are many small independent galleries. Many of New Zealand's best-known artists came from or live in Palmerston North. The list includes Rita Angus, John Bevan Ford, Shane Cotton, Paul Dibble, Pat Hanly, Brent Harris, Bob Jahnke, John Panting, Carl Sydow and Tim Wilson. Regent on Broadway Theatre is a 1393 seat multipurpose performing arts facility. Centrepoint Theatre is a prominent professional theatre and the only one outside the main centres of New Zealand. Top comics including John Clarke, Jon Bridges, Jeremy Corbett, Tom Scott all come from Palmerston North as do stage,television and film performers Paul Barrett, Shane Cortese, Kate Louise Elliott, Simon Ferry, Greg Johnson, Jeff Kingsford-Brown and Alison Quigan. Palmerston North is reputed to have the highest number of restaurants, eateries and cafe bars per capita in New Zealand. There is a vast selection of ethnic food options including Thai, French, Chinese, Indian, Korean, Japanese, Cambodian, Mongolian, Italian, Irish, American, Pacific rim and New Zealand cuisines. Palmerston North has a thriving musical scene with many national and international acts touring through the town, and many local acts performing regularly. Local groups include the Manawatu Sinfonia and Manawatu Youth Orchestra (MYO) who perform throughout the year. Both these groups rehearse at Square Edge under the guidance of Mr Schwabe, the conductor who has been present within the musical community of Palmerston North for a number of years now. The Manawatu Youth Orchestra celebrated its 50th year in September 2011. Within the community there is also the Manawatu Concert Band (MCB) which holds its practices at Freyberg High School. Participation in sport is an important and popular pastime in Palmerston North. Representation at a national level is predominantly provincial based, meaning most sports teams representing Palmerston North also draw their players from other towns from around Manawatu. The premier multi-sports venue in Palmerston North is Arena Manawatu (previously the Palmerston North Showgrounds). The main stadium of Arena Manawatu is called Arena One (sponsorship purposes, FMG Stadium) and is the home of rugby and the Robertson Holden International Speedway. There are indoor venues at Arena Manawatu where netball, basketball and volleyball are played. Other important venues include Memorial Park, Fitzherbert Park, Celaeno Park, Manawaroa-Ongley Park, Skoglund Park, Vautier Park and Massey University sports fields. # : not based in Manawatu, however home ground when playing in Manawatu. Palmerston North is a significant road and rail junction. As such, it is an important distribution hub for the Central and lower North Island, with many freight distribution centres based here. is the main State Highway in Palmerston North. , New Zealand's main highway, passes about 25 km (16 mi) to the west of the city. intersection the main portal to and from the north. intersection the main portal to and from the east (from Ashhurst and Napier). These four streets meet at the Square. Heavy vehicles are prohibited in the Square and a city ring road exists for such traffic. is an alternative road to the Manawatu Gorge from the southern side of the Manawatu River. from Levin. Enters from the southwest. Milson Line, Railway Road, Roberts Line and Stoney Creek Road are alternative entries in the north from Feilding and rural northern Manawatu. Pioneer Highway is the main western portal for traffic from State Highway 1, Foxton, Levin and Shannon. Cambridge Avenue is the main street of Ashhurst. Palmerston North is perceived as being better for cycling than most New Zealand cities, with 2001 figures putting it a close second only to Blenheim in terms of bicycle modal share. However, there has been a large decline in bicycle use, falling steadily from 13% of all commuting trips in 1986 to 5.42% in 2006, significantly faster than any other transport mode. Palmerston North has a fairly comprehensive 65 km on-road bicycle lane network, particularly in high traffic areas, to make it safer for people to get around the city by bike. The cycle lane network has been criticised for a number of reasons. Motor traffic is often too fast, and there is no physical barrier between bicyclists and motorists. Most bicycle lanes in the city are marked out with parking spaces for motorist parking, making those lanes 'pointless' and raising the risk of motorists opening car doors into the path of passing bicyclists. Rebecca Oaten, the so-called 'Helmet Lady' who campaigned nationwide in the late 1980s for a New Zealand bicycle helmet law, is from Palmerston North. Services are coordinated by Horizons Regional Council, through Masterton-based bus company, Tranzit. Five urban buses leave the terminal in Main Street East (in front of Palmerston North Courthouse) at least every half hour. The buses are assigned to loop routes servicing different parts of the city. Buses are provided for students of Massey (both campuses) and IPC. Daily services run to the nearby towns of Linton, Ashhurst and Feilding. Inter-regional routes are operated by Intercity, Tranzit and Nakedbus. Intercity's routes run south (to Wellington), north (towards Auckland, via Wanganui, Rotorua and Taupo, or Napier) and east (to Masterton) from a terminus at the intersection of Main and Pitt Sts. Naked Bus runs from outside the iSite in The Square. International services began in 1996, with Freedom Air's flights to and from Sydney and Brisbane. However since March 2008, there have been no international services since Freedom Air ceased to operate. The proposed replacement carrier OzJet cancelled its plans only days before they were due to commence. Palmerston North International Airport's last international flights stopped at around the beginning of 2007. There are hopes to eventually resume international flights from Palmerston North. Domestic services include flights to and from Auckland, Hamilton, Wellington and Christchurch, operated by Mt Cook Airlines, Eagle Airways and Air Nelson, under codeshare agreements with Air New Zealand, Virgin Australia and Singapore Airlines. The airport is the operational base of the Massey University School of Aviation. The airport is a busy freight hub at night. Palmerston North International Airport was upgraded/improved in 2011. Palmerston North is an important passenger and freight stop on the North Island Main Trunk Railway. There are only two passenger trains run by KiwiRail: the weekday-only Capital Connection commuter train once a day to and from Wellington, and is a stop for the Northern Explorer to and from Auckland and Wellington. Until 1964, the railway ran through the city centre, with Palmerston North Railway Station in The Square. The station was moved and the track diverted 2.5 km (2 mi) to the north by the Milson Deviation in 1959-1963; work on the deviation had started in 1926. Near the current railway station, the North Island Main Trunk railway is joined by the Palmerston North - Gisborne Line, which runs through the Manawatu Gorge to Woodville and Hawke's Bay. A connection to the Wairarapa Line is at Woodville. The major daily newspaper is the Manawatu Standard. Weekly community newspapers include the Tribune and the Guardian. Most radio stations are based outside the city, however some on the nationwide networks have studios in Palmerston North. Ngāti Rangitāne were the local Māori iwi (tangata whenua) living in the area known as Te Ahu-ā-Tūranga, when a trader, Jack Duff, became the earliest known European to explore the area c.1830. He came on a whaling ship, and explored possibly as far inland as the site of Woodville. He reported his discovery on arrival back to Porirua. Colonel Wakefield heard of the potential that the Manawatu had for development and visited in 1840. In 1846 Stephen Charles Hartley, another trader, heard from tangata whenua of a clearing in the Papaioea forest and he proceeded through the dense bush and forest and discovered it for Europeans. In 1858, the Government began negotiations with local iwi to purchase land in Manawatu. There is dispute at the time between rival iwi Ngāti Rangitāne and Ngāti Raukawa as to who has the right to sell. The dispute is resolved in favour of Rangitāne. On a visit in 1859, John Tiffen Stewart, an employee of the Wellington Provincial Council, was shown the Papaioea clearing by Rangitāne chief, Te Hirawanu, and noted its suitability for a "good site for a township". In 1864, Te Ahu-a-Turanga Block was sold by Rangitāne to the Government for £12,000, in an effort to open the Manawatu to settlement. Stewart returned in 1866 on behalf of the Wellington Provincial Council (under whose jurisdiction the new purchase fell) and made the original survey and subdivision in the Papaioea forest clearing. The settlement, named Palmerston to commemorate the recently deceased Prime Minister of Great Britain, was laid out according to Stewart's plan consisting of a series of wide and straight streets in a rectangular pattern. The focal point was an open space of 17 acres (7 ha) subsequently known as The Square. On 3 October 1866, Palmerston was formally endorsed after Isaac Earl Featherston (Wellington Provincial Superintendent) signed a proclamation defining the boundaries of the settlement. The first sections were sold after. Among the first settlers included Scandinavians, who arrived in 1871. They established settlements at Awapuni and Whakarongo/Stoney Creek. Later the same year, the suffix 'North' was added to distinguish the settlement of the same name in the South Island. In 1872 a petition was launched to change the name of the settlement. A public meeting in 1873 ends with no clear decision on the name. The railway line was laid through the Square in 1875. In 1876, Palmerston North became a Local Board District, within the Wellington Provincial Council. This existed until the abolition of the Provinces later the same year. Also in the same year, the council set aside land north of the Manawatu River for the purposes of a reserve. In 1890, this land was again set aside and would become in 1897, the Victoria Esplanade. By 1877, when the Borough Council came into existence, Palmerston North was an isolated village in the midst of the native forest that covered inland Manawatu. By 1878, the population was approximately 800 people and sawmilling was the main industry of the district. As the settlement grew, the forest diminished to make way for farms and housing, and today virtually no remnant of it survives. The arrival of the railway in 1886 saw an increase in the speed of growth and the town was at the centre of a lucrative agricultural district. The opening of the nearby Longburn Freezing Works provided employment, while the Borough Council instigated more infrastructural schemes such as the sewerage system. The Railway through the Manawatu Gorge to Napier was completed in 1891. In 1893, Rangitāne sold the Hokowhitu block, increasing the area of land available for settlement. In the same year, the Public Hospital opened in a wooden building on Terrace Street (now Ruahine Street). The hospital required significant fundraising. At the end of the decade, the Boer War broke out in South Africa and men from Palmerston North volunteered. By 1900 the population was 6,000. In 1902, the Manawatu River flooded. In the 1910s Palmerston North's growth was steady. The population in 1911 about 10,991 (excluding Māori). The city was affected by World War I, with Awapuni Racecourse being used as an army training camp in 1914. During the course of the war, the Borough Council renamed all German-sounding and foreign street names. When the war finished in 1918, celebrations were delayed due to the Influenza epidemic. In 1930, the population reached the 20,000 threshold and Palmerston North was officially proclaimed a city, the 7th in New Zealand. Development was slow due to the great depression and World War II. An airport was established at Milson in 1936, which is now Palmerston North International Airport. From 1938, the first Labour government (1935-1949) initiated state housing programmes in West End (Savage Crescent precinct) and Roslyn. In 1940 the Māori Battalion was formed in Palmerston North and trained at the Showgrounds (now Arena Manawatu). In 1941, the Manawatu River flooded again. Large parts of Hokowhitu and Awapuni were underwater, with residents evacuating to higher ground (peaked at 5.8m). In 1942, Linton Army Camp was established. After the war, growth was rapid. In 1950, the city was enlarged to include Milson and Kelvin Grove. In 1953, the boundaries would extend to include Awapuni, which again, in the same year, was flooded by the Manawatu River, along with Hokowhitu. The largest flood since 1902. Although work had started in 1926, it was not until 1959 the Milson Deviation of the North Island Main Trunk was opened, meaning future trains will pass to the north of the city, instead of through the Square. Later in 1963, the railway station at Tremaine Avenue opens. The last trains pass through the Square in 1964. In 1961, the Highbury was added to the council area. In 1963, Massey University College of Manawatu was formed by the amalgamation of the Massey Agricultural College with the Palmerston North University College. In 1964, it becomes Massey University of Manawatu, an autonomous tertiary learning institution with the power to grant its own degrees. In 1967, city boundaries were again extended to include land in Aokautere, Kelvin Grove, Milson, Amberley (Westbrook) and Awapuni as part of future growth for the next 25 years. In 1970, the Rugby Museum was established and a tribute to the founding father of rugby in New Zealand, Charles Munro, was opened at Massey University. In 1971, a competition to design a civic building for the vacant railway land at the Square, is won by Wellington architects, Maurice and John Patience. The resulting building was finished in 1979. In 1976, the Manawatu and Oroua rivers flood, 24 hour rainfall records in Feilding and Palmerston North are exceeded and some residents from both locations are evacuated. In 1977, Palmerston North City Council celebrated its Centenary of Municipal government. The Queen and the Duke of Edinburgh are among visitors to Palmerston North. On 1 November 1989, New Zealand local government authorities were reorganised. Palmerston North City boundaries were extended to include Ashhurst, Linton and Turitea through amalgamation of parts of the former Kairanga County, Oroua County and Ashhurst Town Council. On 1 July 2012, Bunnythorpe, Longburn, part of the area around Kairanga and an area around Ashhurst were joined to Palmerston North City Council area. Palmerston North is governed by a city council and for representation purposes, the city is divided into five wards (previously 6, however, 2 wards have amalgamated). They translate as four urban and one rural ward. New additions from Manawatu District to PNCC: Bunnythorpe, rural Cloverlea, Longburn and the rural area south of Bunnythorpe to Ashhurst, were added to Papaioea, Takaro, Awapuni and Ashhurst-Fitzherbert respectively. There was a minor change to the northern ward boundary of Hokowhitu. The Chief Executive is Paddy Clifford. Palmerston North is the seat of the council. Palmerston North has 3 electorate MPs in Parliament. The boundaries of the electorate of Palmerston North have changed often since the introduction of MMP. It has been previously larger than now and formerly extended over the Manawatu River into the southern suburbs. A 2007 redraw transferred the southern suburbs to Rangitikei, in return for Kelvin Grove and Milson, making Palmerston North a completely urban electorate. Currently Palmerston North is surrounded by the Rangitikei electorate. The electorate is represented (2008- ) by Iain Lees-Galloway of Labour. The large electorate of Rangitikei extends south to Palmerston North's southern and eastern ward (Ashhurst-Fitzherbert), therefore completely surrounding the electorate of Palmerston North (the only electorate thus surrounded completely by another). The electorate formerly represented (1999-2011) by Simon Power of National, is from 2011 represented by former Manawatu District Mayor Ian McKelvie (National). This large electorate includes all of the Palmerston North area. The electorate is represented by Tariana Turia of the Māori Party. An NAC Vickers Viscount (ZK-NAI) was named "City of Palmerston North". This aircraft was withdrawn from NAC service in 1975. ^ "Introduction to Palmerston North". Palmerston North City Council. http://www.pncc.govt.nz/About/IntroToPalmerstonNorth/. Retrieved 2008-02-08. ^ "Climate Data". NIWA. July 2011. http://www.niwa.co.nz/education-and-training/schools/resources/climate. Retrieved 2 November 2007. ^ "The Manawatu Community". Manawatu - Our Region. http://www.ourregion.co.nz/community.php?category=clubs&clubCategory=2. Retrieved 2008-07-04. ^ Hamilton Alternatives to Roading Study (HARTS). "Assessment of Walking and Cycling". October 2005. Retrieved 2011-09-01. ^ a b Horizons Regional Council. "Annual Report on the Implementation of the Regional Land Transport Strategy", 2009-10. September 2010. Retrieved 2011-09-01. ^ "Cycling Facilities". Palmerston North City Council. 2010. http://www.pncc.govt.nz/ServicesAndFacilities/Facilities/Cycling/Detail.aspx?id=493. Retrieved 2011-08-31. ^ "Cyclist injured in cycle lane - Palmerston North". CAN - Cycling Advocates Network. 17 August 2008. http://can.org.nz/article/cyclist-injured-in-cycle-lane-palmerston-north. Retrieved 2011-08-31. ^ "Helmets 'may be deterring cyclists'". Stuff.co.nz. 23 October 2008. http://www.stuff.co.nz/the-press/news/national/686712/Helmets-may-be-deterring-cyclists. Retrieved 2011-09-29. ^ "Topic: John Tiffin Stewart". Kete Horowhenua. http://horowhenua.kete.net.nz/site/topics/show/218-john-tiffin-stewart. Retrieved 2008-07-04. ^ "1890s". Palmerston North City Council. http://www.pncc.govt.nz/About/History/Detail.aspx?id=2043. Retrieved 2008-07-04. ^ "1910s". Palmerston North City Council. http://www.pncc.govt.nz/About/History/Detail.aspx?id=2043. Retrieved 2012-11-13. Wikivoyage has a travel guide for Palmerston_North. This page uses content from the English language Wikipedia. The original content was at Palmerston North. The list of authors can be seen in the page history. As with this Familypedia wiki, the content of Wikipedia is available under the Creative Commons License.